If you’re on a modern version of iOS you have easily accessible hourly weather updates on iPhone, but if your iPhone is running a much older version of system software it’s a bit different. 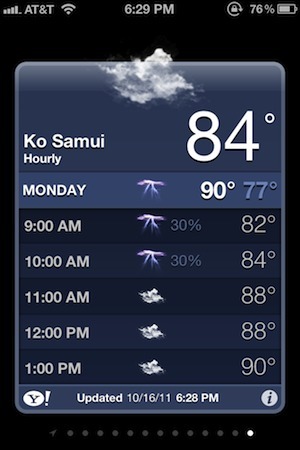 Fortunately the weather app in iOS 5 has been improved to include quickly accessible hourly forecasts, in addition to the percentage chance of rain and severe weather, like thunder and snow storms. The forecast data is pulled from Yahoo, who aggregates the hourly details from The Weather Channel. This is a feature that may seem simple, but it’s been highly desired and has led many users to download third party weather apps in search of more detailed forecasting information. Detailed forecasts are limited to any iPod touch or iPhone running iOS 5. The iPad currently does not include the native weather app, but iPad users can obtain the exact same forecast and weather data through the freely available The Weather Channel iPad app from the iOS Store. I wholeheartedly applaud this upgrade. For once, it’s actually accurate and I don’t have to download a 3rd party app! Well done. Shame about IOS5 sucking my battery dead! i can’t see all the hours in my hourly forecast. for example, my phone says its 746 am, but the hourly forecast for today starts at 4pm. any ideas?